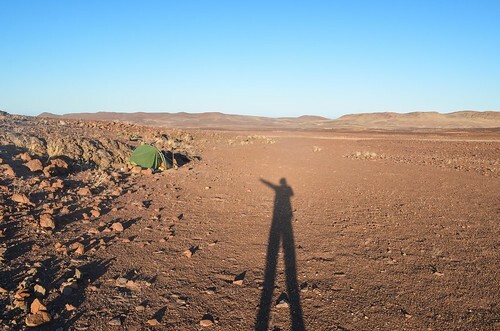 Waking up in the desert is fantastic. As fantastic as it is terrible to find a wind shelter for setting up my tent. 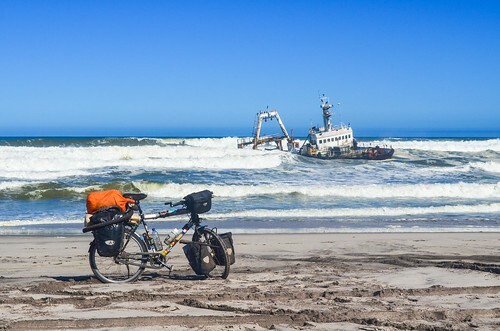 Luckily the wind went quiet during the night, and now I should pack quickly and cycle the 40 remaining kilometers until the coast before it gets up again. 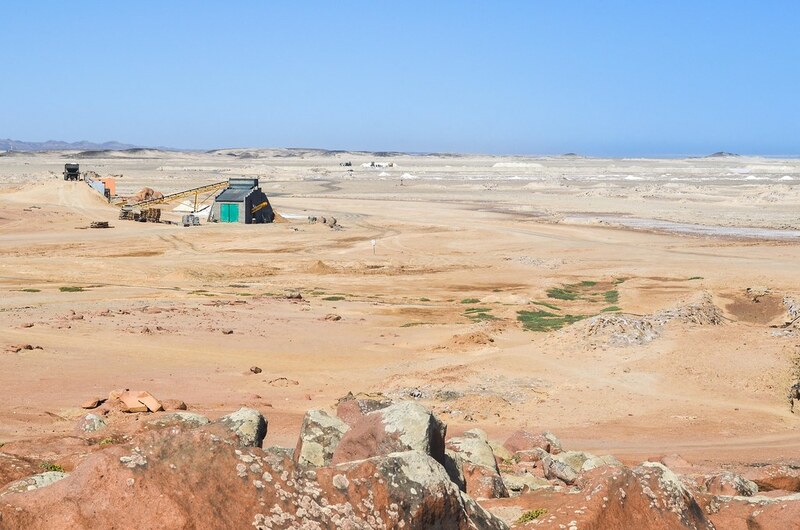 My 3-day objective is to reach Swakopmund on time for a visit of the Rössing uranium mine. 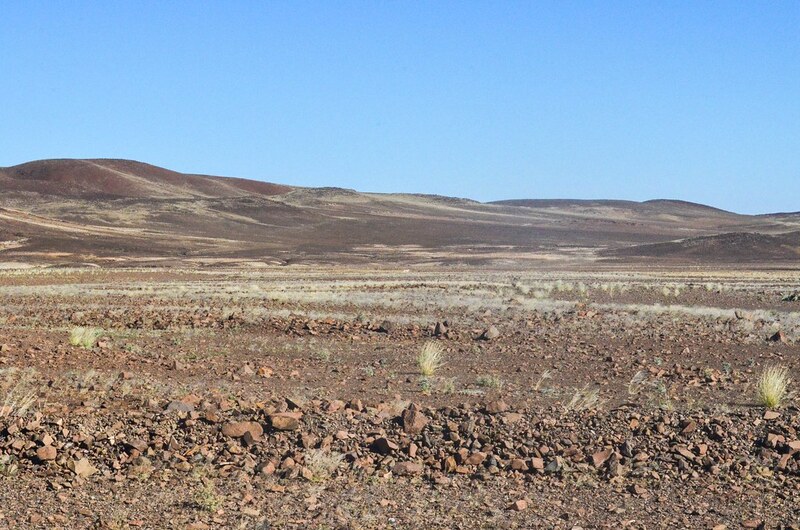 The Dorob national park is another place to realize how bare and arid Namibia is. I keep with me a gemsbok (oryx) horn I found around. I doubt it will be decisive if I happen to face a hungry predator, but at least it gives me the (small) impression of riding a unicorn. The landscape is dotted with the desert-surviving welwitschia plants. 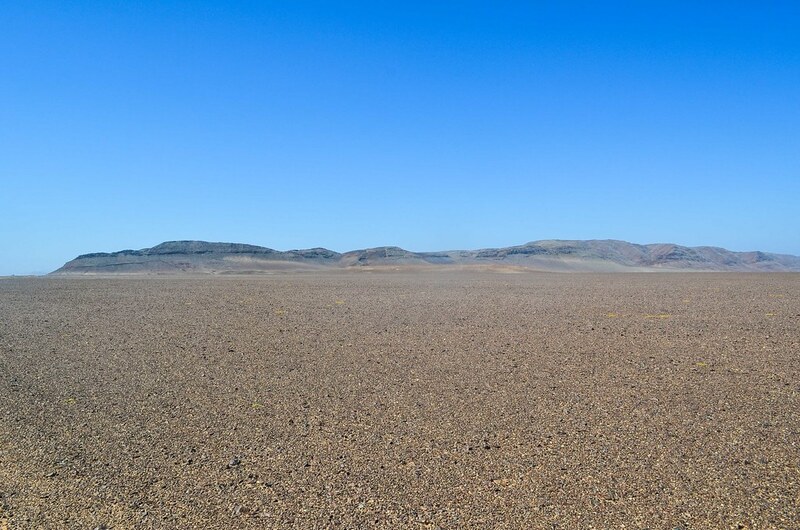 There is not much activity; I have seen only two cars and a 4×4 convoy yesterday, two 4×4 convoys the day before, and today I won’t see any car until the coast. There are also springboks jumping in the distance. 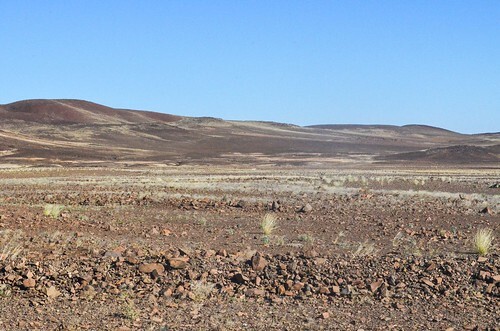 Actually, I’d rather not see anything, because if a desert lion decides to show up in this region, I have nowhere to hide. 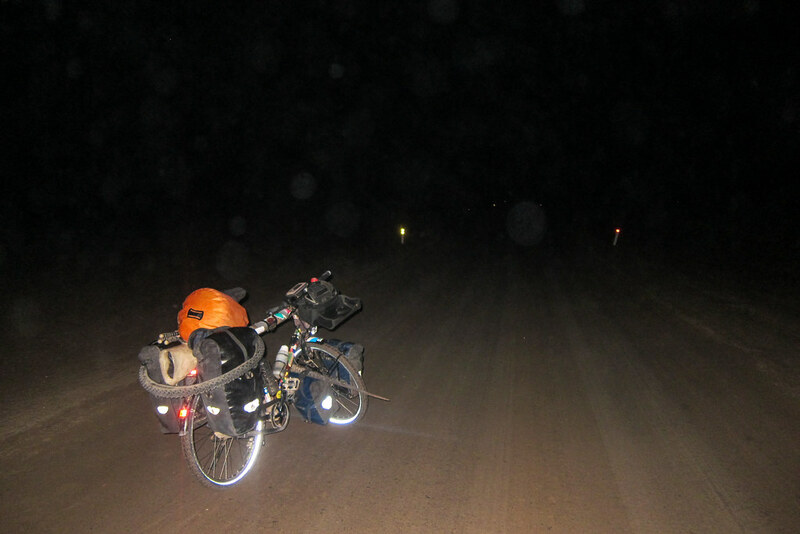 The headwind is bearable and I am really looking forward to reach Mile 108. It is the name of a campsite located 108 miles north of Swakopmund, halfway between this beach resort (and 4th largest Namibian city) and the remote settlements of the Skeleton Coast NP. Finally! Back to “civilization”. 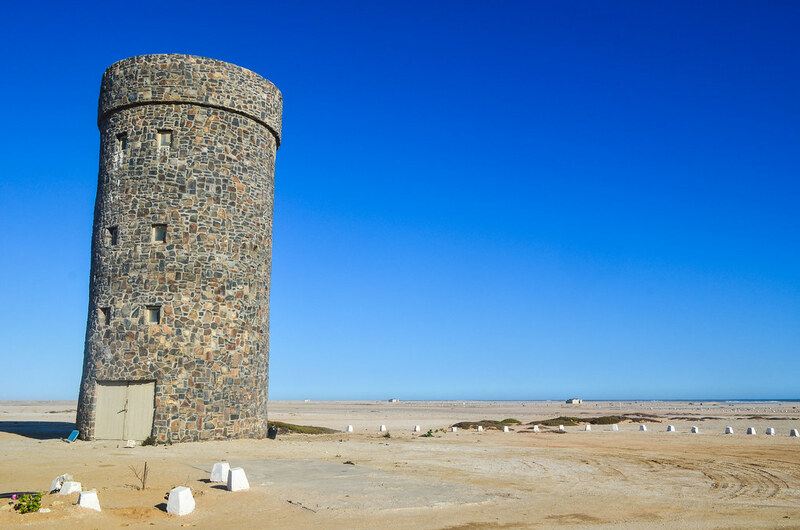 Mile 108 water tower, and … the sea! After three days out of network coverage, I’m back to a “normal” road, a road that links places where people actually live. It has been three tough but rewarding days in a fantastic scenery. 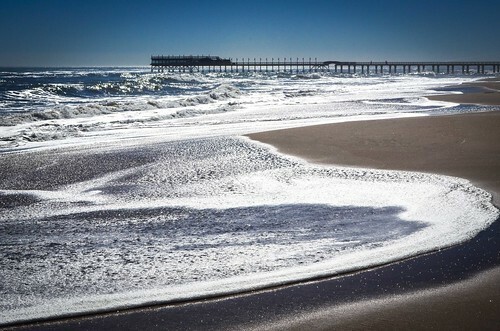 The wind is getting stronger and comes from the south, a very bad news for me. 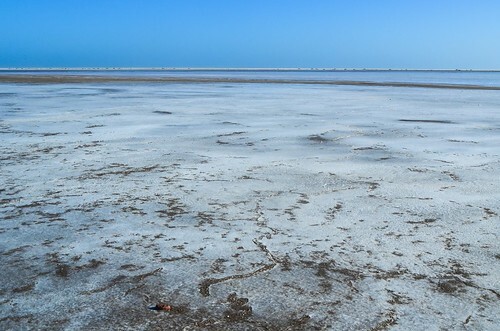 I will have to follow the salt road heading straight south from now on. Someone on the road told me “you should have gone the other way around, because it you catch the SW wind, you will have a hard time“. 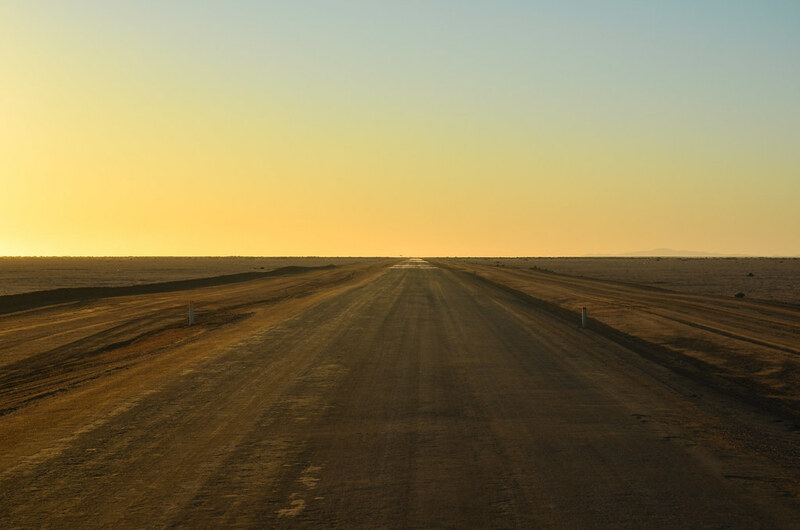 I can’t simply “go the other way around” as I am going mostly from north to south and not taking twice the same road, but this time, I really wish I could. 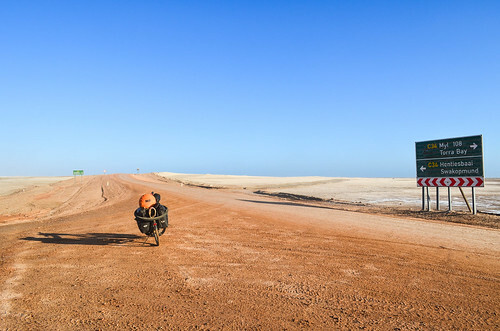 At Mile 108 on the salt road, civilization means cellphone coverage, two staff, water tanks, and a hundred of rustic camping places for only one visiting car. The places along the Skeleton Coast are full during the high season, but for now it’s a bit depressing. It’s a popular destination for angling fans, but these days are not good for fishing. 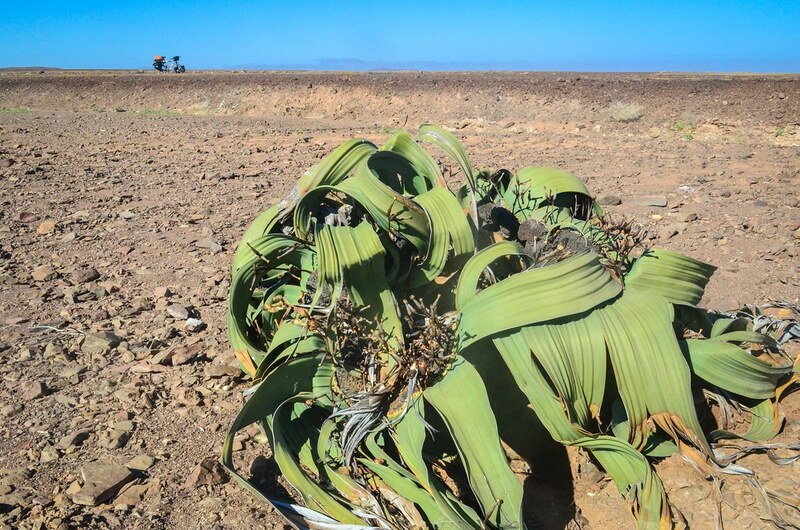 Sara, working here, tells me the wind is not so strong. 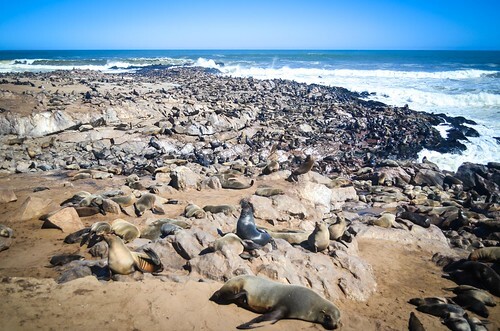 The C34, between Swakopmund and the Skeleton coast national park, is for its southern half built with sand and salt. 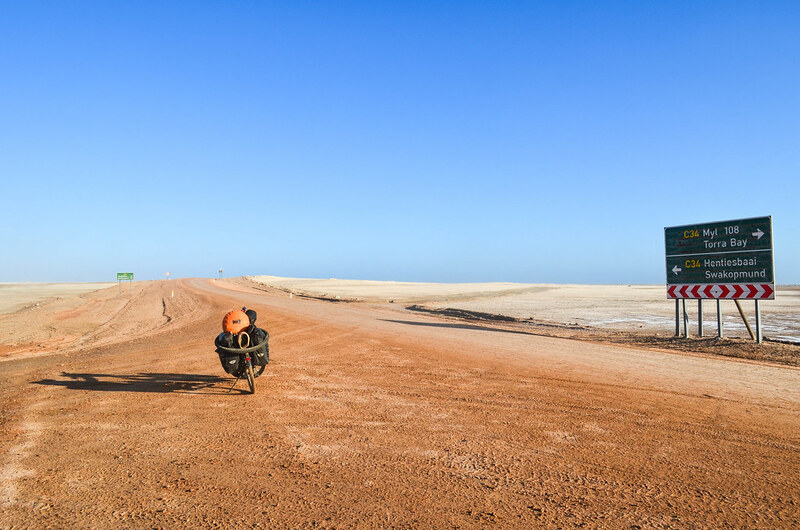 I wanted to reach the coast north of Swakopmund mostly to have the experience of riding a salt road. 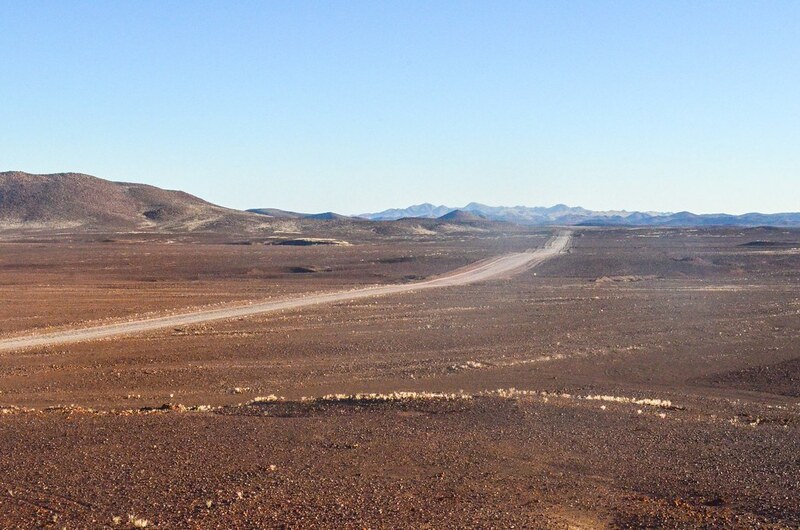 It looks like a very good laterite road, hard packed and very smooth, fitting perfectly into the landscape. In misty corners, or when the road is too close to the sea, the surface “melts” and I’d rather avoid dipping my tires in that corrosive solution. 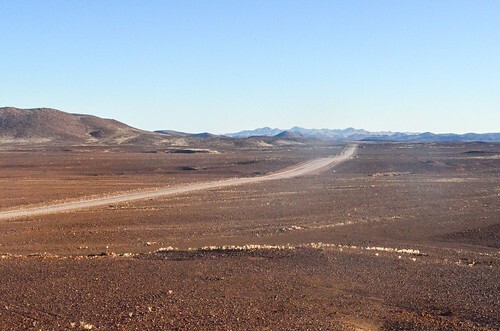 This road travels the length of the Skeleton Coast. I wanted (yet another) journey into the wilderness, and that’s probably the wildest and most desert coastline one can visit. 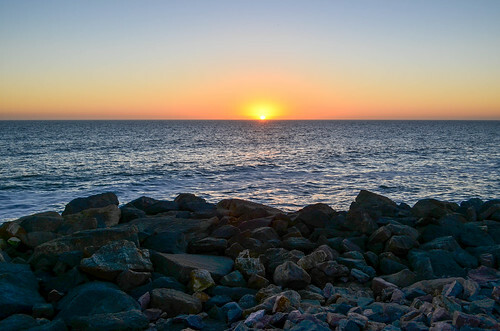 First, this section of the African coastline has never interested anyone for a long time. It fell into the hands of the Germans in a late attempt to join the colonial race. 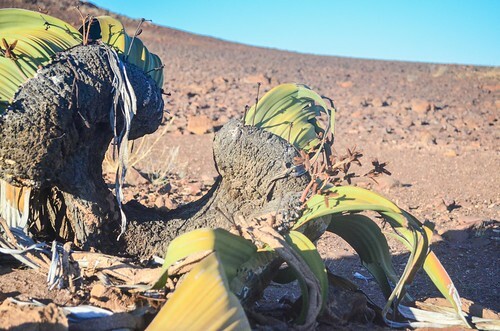 Apart from lichens, nothing grows in this highly inhospitable land which receives less than 10 mm of rainfall annually (equivalent to an hour of heavy rain). 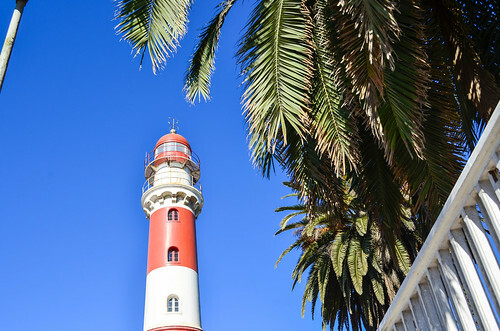 Along the 1500 km of Namibian coastline, only three cities above 10’000 inhabitants are found: Swakopmund, Walvis Bay, and Lüderitz, owing their existence to the rivalry between the British and the Germans, and to the diamonds. 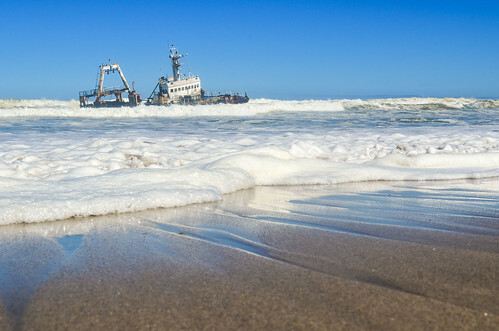 The Skeleton coast earned its charming name through stories of the many ships, aircraft, and trucks, which crashed there and were never seen again, giving birth to a kind of shipwreck tourism. The northern part of the coast, above the Ugab river mouth, is a restricted area, accessible only with a permit and a solid car. In other words, unless you have a 4×4 and like fishing, there are no reasons to go there. The awful headwind is not stopping and I progress at a stunning average speed of 8 km/h. It’s hard to convey it with photos, but it will be featured in my future videos. There’s no way I can sleep there without a wind shelter and I must make it to Cape Cross, a small headland with a lodge and a campsite. 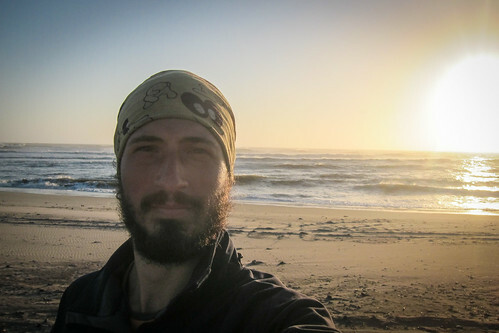 When I left Mile 108, I had 3 hours of daylight left to cover a distance of 40 km. The sun is now setting and I am still 20 km away. The wind is rather cold and I had to wear my jacket, which has turned wet from my sweat. I am now cycling at night and against the wind, and it’s not fun at all. 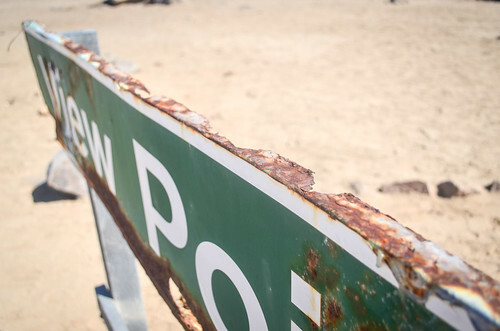 I was told hyenas and jackals regularly visit the beach to scavenge, and I’d rather not meet them. 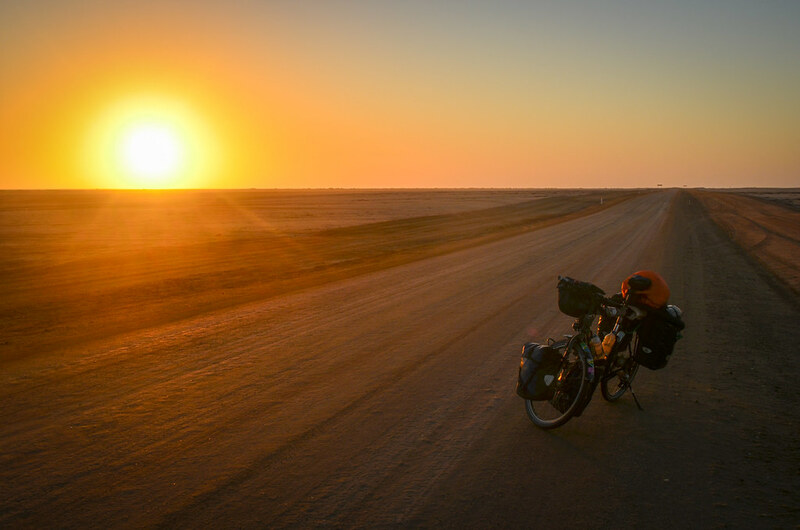 Until Cape Cross, I cycle for two hours, as fast as the headwind allows me, under the stars. It’s quite special but I am freezing. These two hours are really horrible. I put this day in the Top 5 of my worst days. 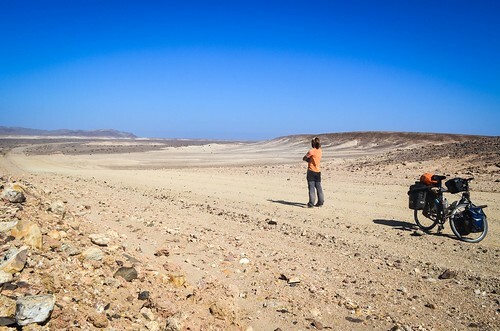 I can already see the lights of Cape Cross in the distance, although I have more than an hour to battle to get there. 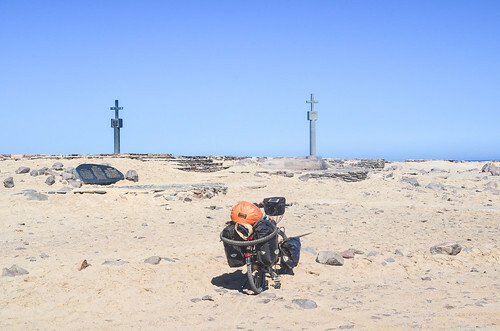 I finally make it to the Cape Cross campsite, a mere four kilometers off the salt road. I’m wet, I’m exhausted, I’m hungry, but above all I am so happy to end the day. It’s 8 pm. This building in front of me says “deliverance” … I made it. I walk to the reception, trying to hide a spontaneous smile that impulsively counter balances the distress surrounding me until a few seconds ago. Price for camping? 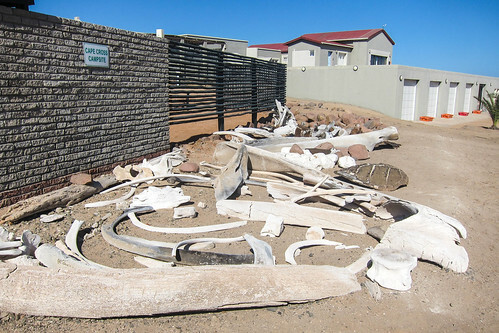 N$ 400. Or 40 USD. Just for having a hot shower and sleeping outside. “We make out own electricity and own water“, they justify themselves. 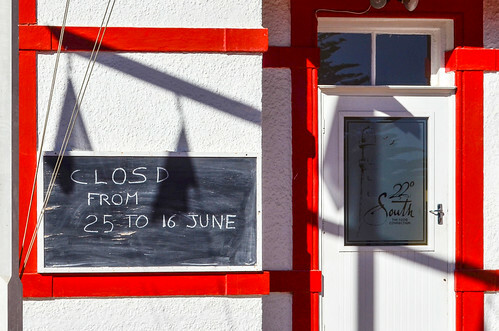 But almost every lodge in remote places do, and they would “only” charge an improbable N$ 200 for camping, at most (which is more than any hotel I’ve stayed at in West Africa). The manager cuts down the price by 50%, which still makes the most expensive campsite I’ve ever stayed at, and I sit by the fireplace while eating cookies at the speed of a chocolate-covered neutrino. 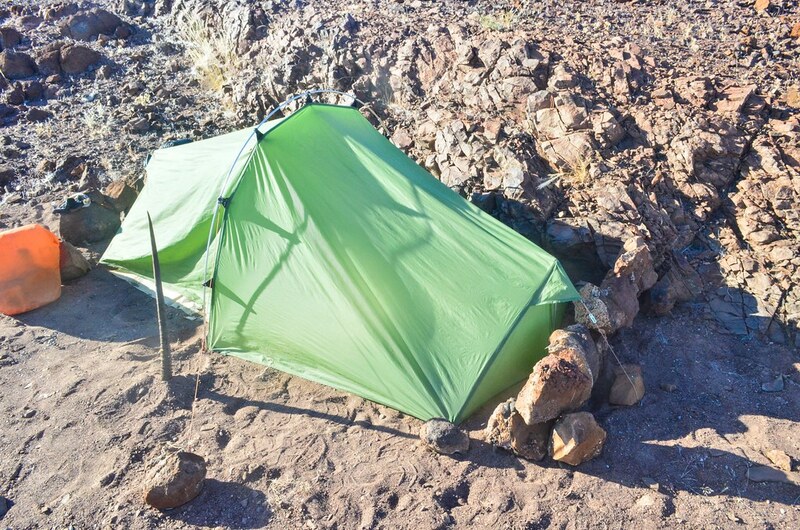 A well deserved hot shower later and I set up my tent against a wall. They told me that the mornings are often wet and misty, and the fog doesn’t lift until 10 or 11. In case the morning is clear, it would mean the wind will be strong. My shoes are to be replaced already. I’m on my fourth set of band-aids, as my Chinese pair is almost destroyed and hurting my toes. I have ruined 2 pairs of Chinese shoes in two months, or more accurately, these Chinese shoes have ruined my feet, while my Salomon trail shoes had lasted for the first 14 months. 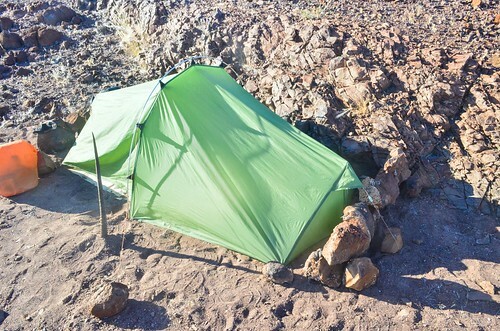 The morning is clear, which means the wind will annoy me today again, but at least I can pack my tent without moisture in the flysheet. 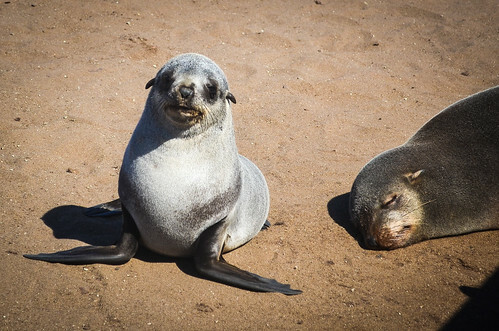 My first stop will be the seal colony, a smelly attraction that puts Cape Cross on tourist maps. 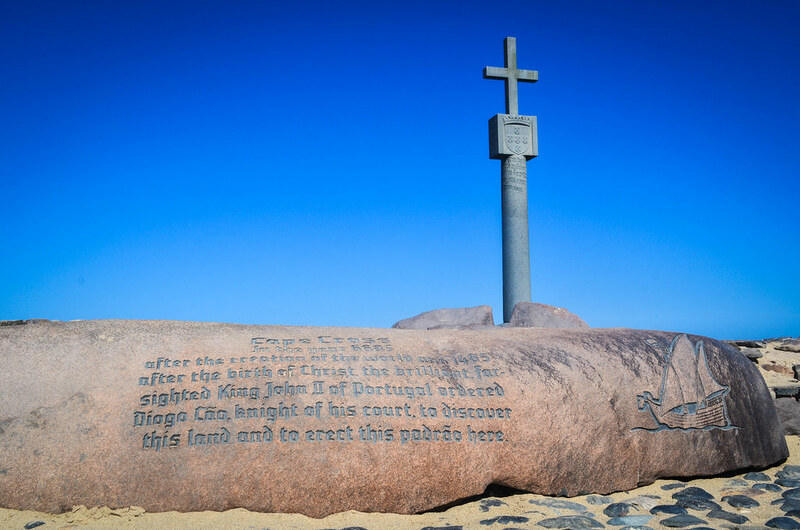 The name of Cape Cross comes from a padrão that Diogo Cão installed there when he sailed until Namibia in 1486, in the days when the Portuguese were “discovering” the “rest of the world”. And indeed, there is a large cross there. Oh no, it seems there are actually two of them. The Germans, who later bought/conquered Namibia, removed the cross in 1893 (now in Berlin) and replaced it with a stone replica. 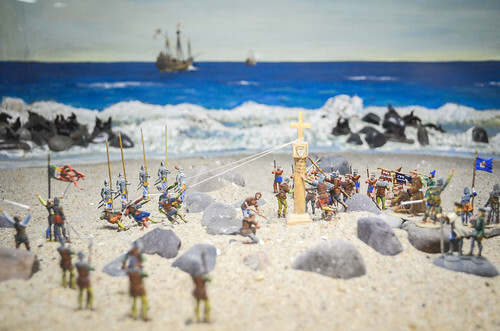 A more accurate replica was then erected. 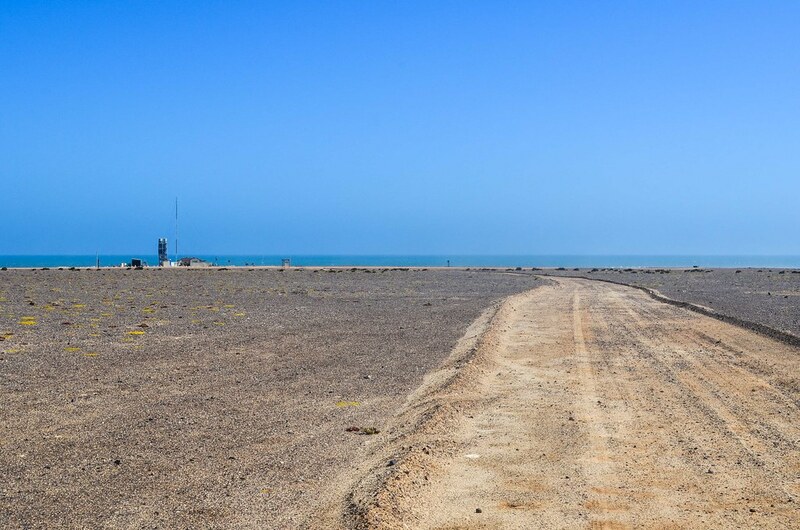 Cape Cross has a long history for a small remote settlement. 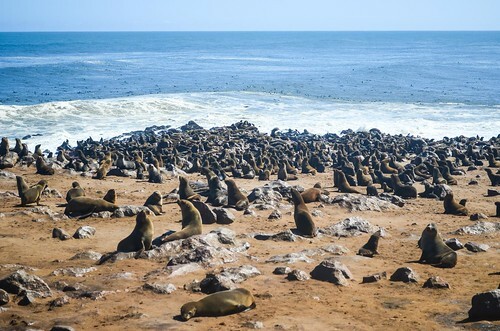 Since 1894, the Germans and the British have exploited two resources at Cape Cross: the guano deposits and the seal skins. 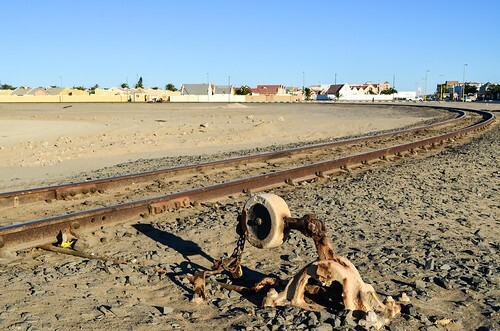 The first railway of Namibia, 21 km long, was built here, and the inhabitants even had a post office, a police station and customs. 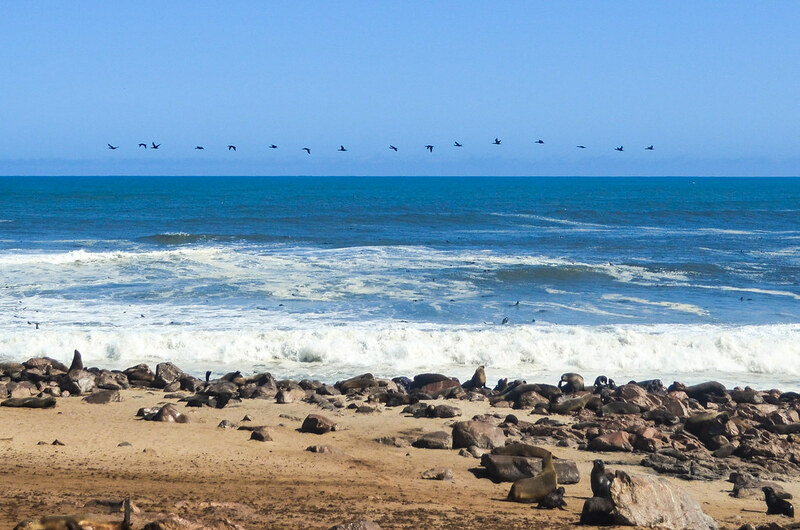 By 1903, the guano production stopped, and the offices closed. Today, Cape Cross is a seal reserve and only the salt pans are worked continuously. One of the largest colony of Cape fur seals in the world is now offering a noisy spectacle to me. It’s not as smelly as it is written, but rather cute, especially the pups. The males weigh up to 200-300 kg for an average length of 2.2 m, so it’s a decent amount of food. 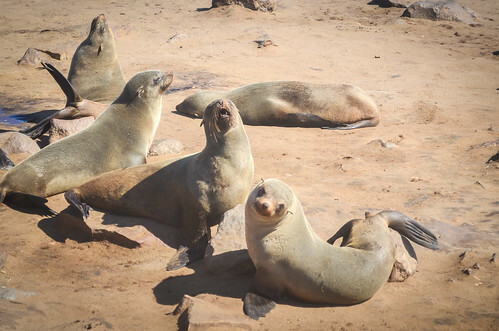 The females are much lighter, between 60-70kg for 1.6 m. They are seen up to 200 km offshore, but at Cape Cross they seem to just tan in the sun. 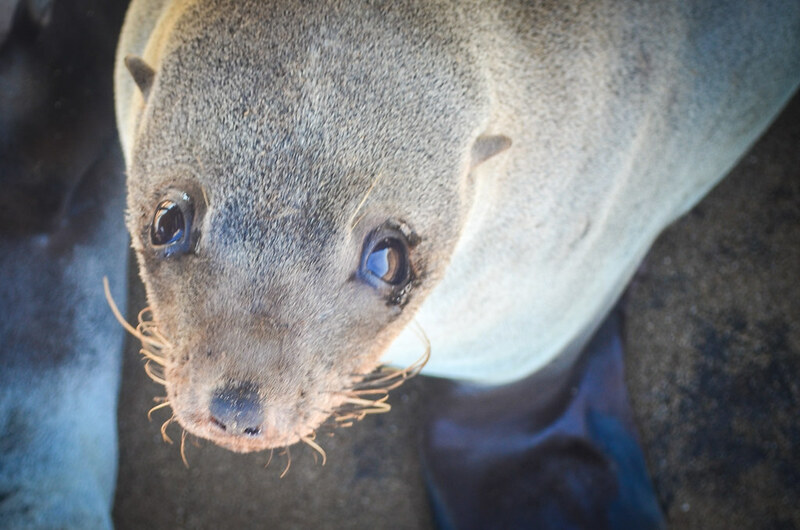 The pups are born in December, so they are all 6 months old now. 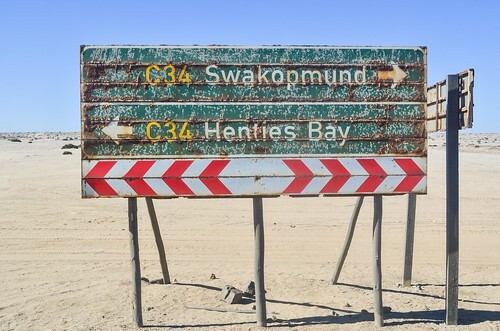 I am now looking forward to reach the small town of Henties Bay for the night. I’m sick of eating 250 g of spaghetti three times a day and I want decent food. I made spaghetti for four days around Twyfelfontein, then I had a double burger in Uis. I am now back on a 4-day spaghetti diet, and am looking forward to a seafood platter! I have been warned many times about the rust. 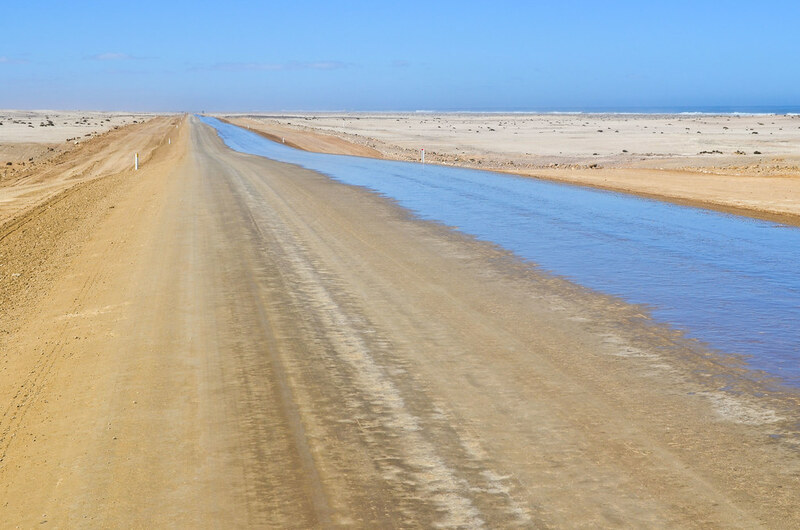 When the locals take their cars for a weekend by the coast on the salt road, they give it a proper cleaning as soon as they return home. I should do the same with my bike once I reach Swakopmund. 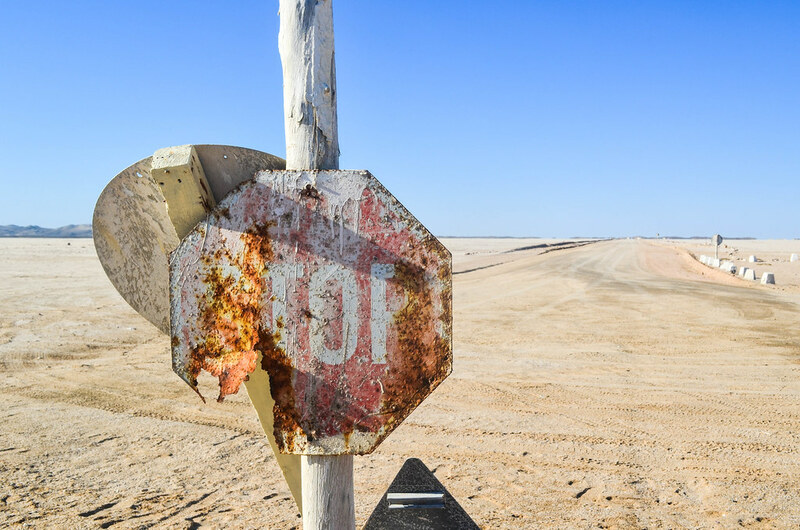 Things don’t last long here: as a result, the rooftops are rubber lined, the sign poles are wooden, the antenna dishes are made of fiberglass … since anything with iron in it will rust quickly. I stop for cooking lunch at Mile 72. 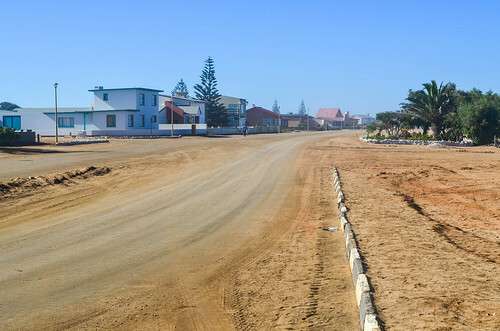 I guess by cycling on this road, I will see and stop at anything man-made until Swakopmund. 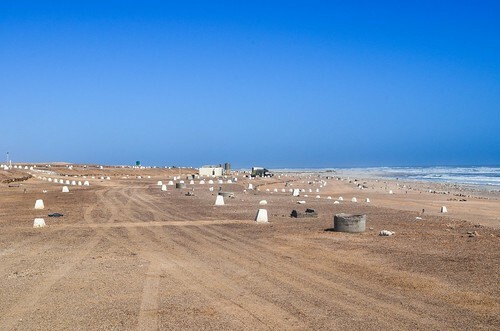 Mile 72 campsite and Mile 108 campsite look very similar, and their “chalets”, low-cost structures on the beach, are the same. 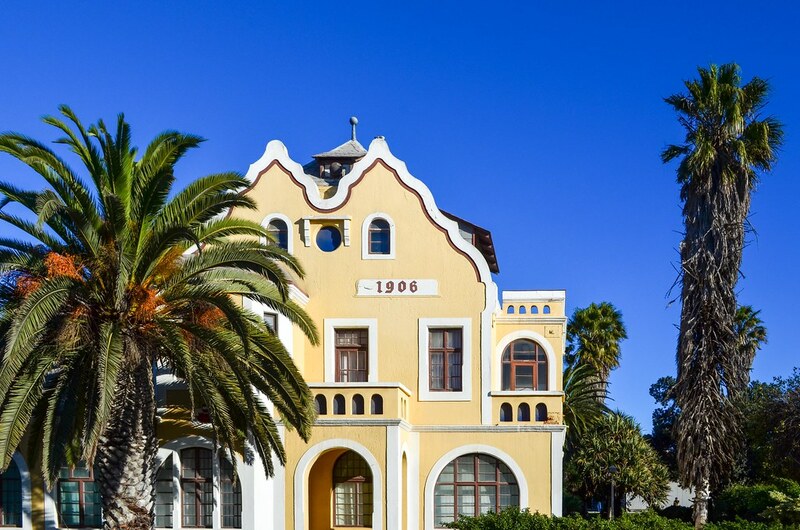 Actually, it is the same owner with the Jakkalsputz, Terrace bay and Torra bay camps, managing them with visibly the minimum investment. Surprisingly the wind is very weak today. After an hour watching the seals, I thought I might be late for Henties Bay, but I make it with the sunset. 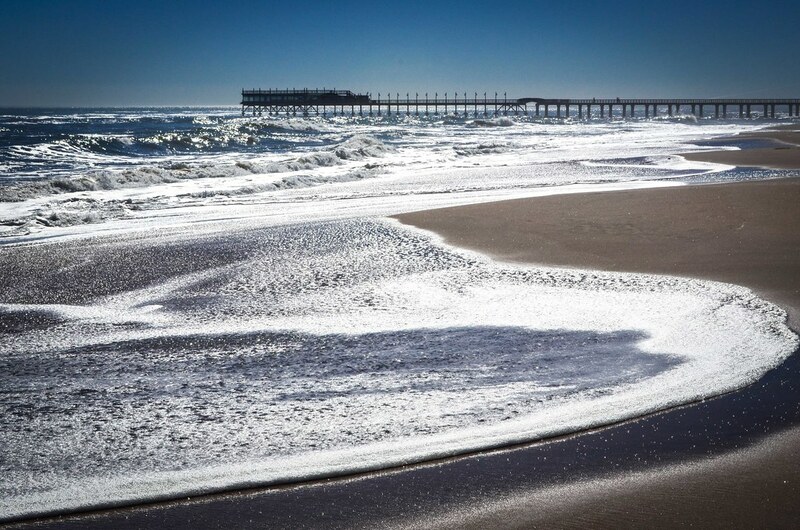 The coastline is made for anglers. Every few kilometers, a sign will indicate the fishing spots. 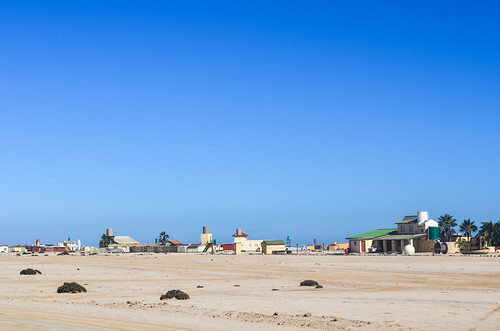 The town of 3000 people of Henties Bay is filled with fishing shops. 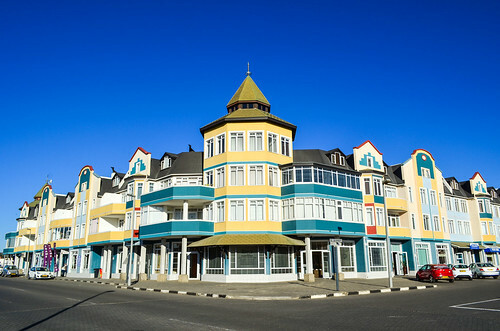 After a little roaming in town at night, I finally find the cheapest place, a 3-bed chalet for N$ 180, which is even less than yesterday’s campsite after 50% discount! Time for real food now. 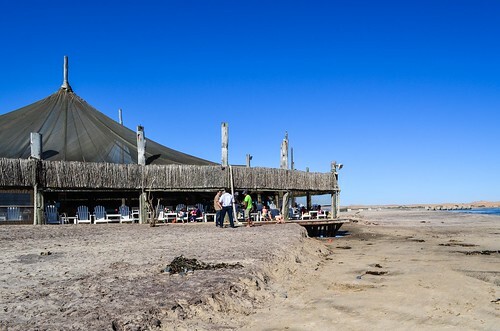 Unfortunately the restaurant can’t serve the popular fishes, confirming that it’s not a successful time for fishing. Well, I have to eat two dinners anyway to compensate my spaghetti-trained stomach. 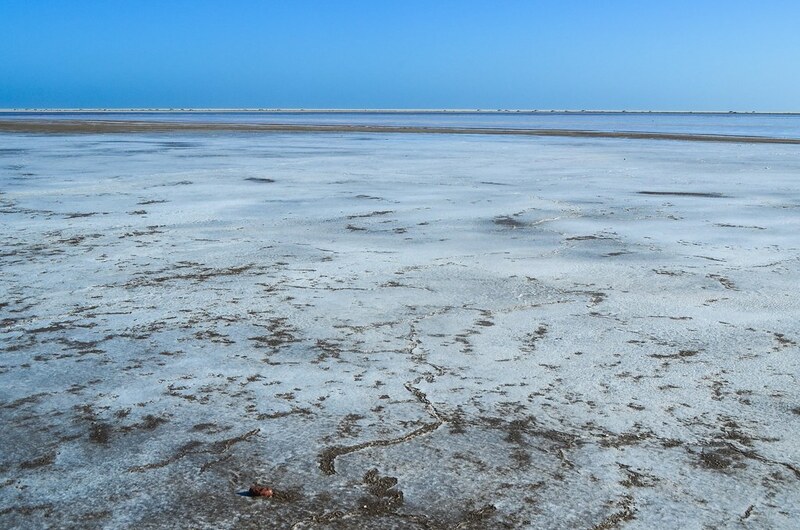 The only shipwreck visible on the southern side of the Ugab river is the Zeila wreck. And my highlight of the day comes at Mile 32: a chameleon is trying to cross the road. He could be smashed, so I push him away and start a photo shoot. 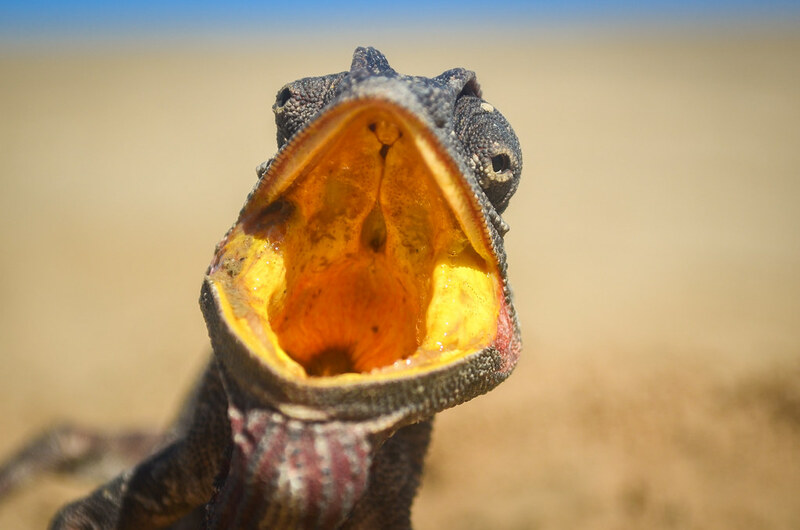 It’s a Namaqua chameleon and he ssshhhhhs with his mouth wide open when he feels threatened. He then tries to climb on my bike on his own. 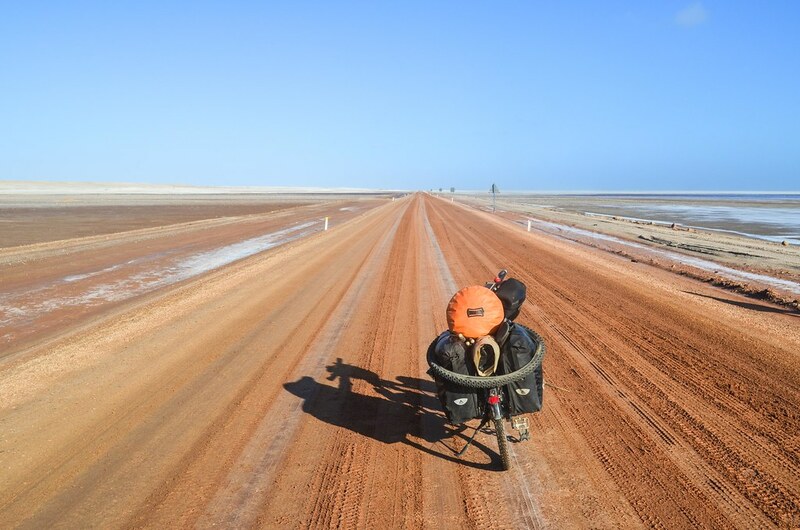 He barely manages to get up a wheel as his hands slip on the spokes. He finally settles on my front pannier and decides he will stay there. I get ssshhhh‘ed if I try to take him away, so well, let’s take him for a ride! If he catches the annoying flies that go into my ears, I’ll keep him with me forever. I now have my version of a dog sticking his head out of a car window. 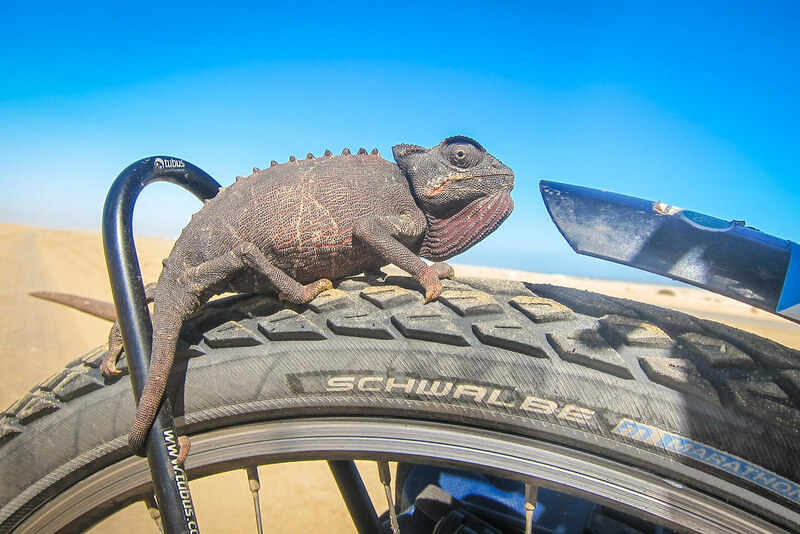 Except it’s a chameleon on a bike pannier with his tail wrapped around the Tubus rack. Put it in a more lyrical way, I’m riding a unicorn with a dinosaur friend! After a few kilometers, since he tries to climb the brake pads while I’m rolling, I take him down before he sticks his hands in the spokes. The only settlement between Henties Bay and Swakopmund is Wlotzkasbaken, where I stop at the Areva poster to eat my sandwich, thanks to the Henties Bay supermarket. 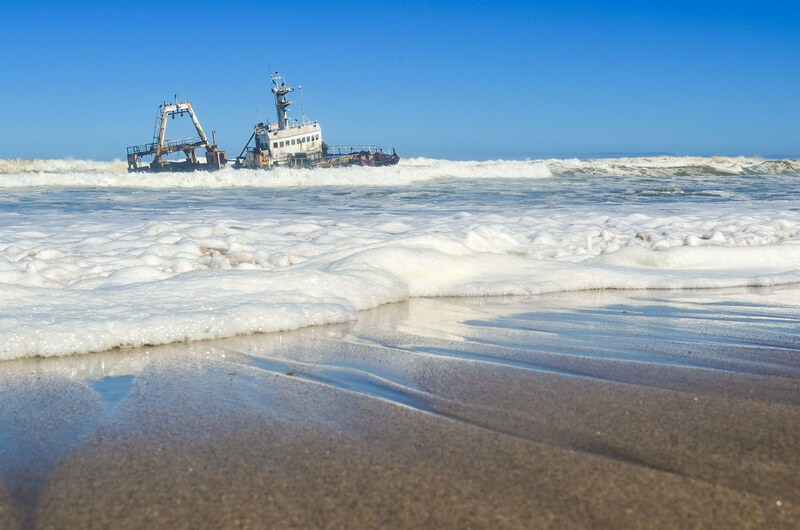 What is Areva doing on the Skeleton coast? Protecting lichen fields and warning against offroad driving? 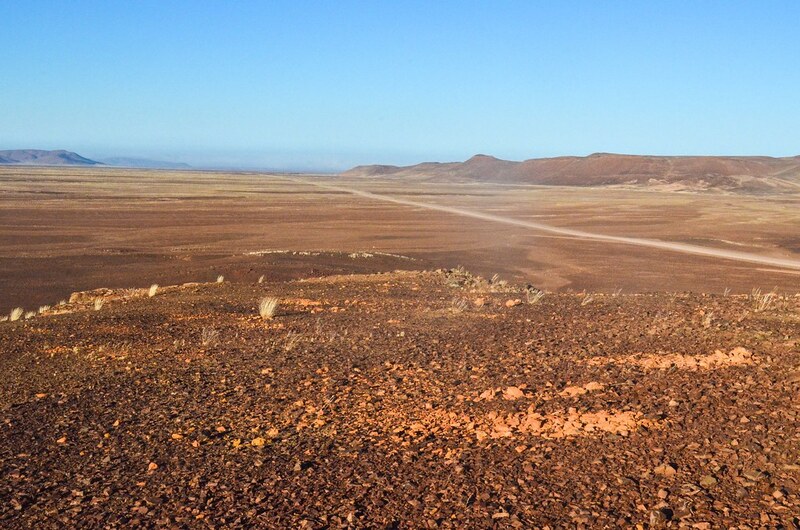 It’s true that offroad driving destroy the landscape and hurts the tiny lichens trying to survive in the desert. 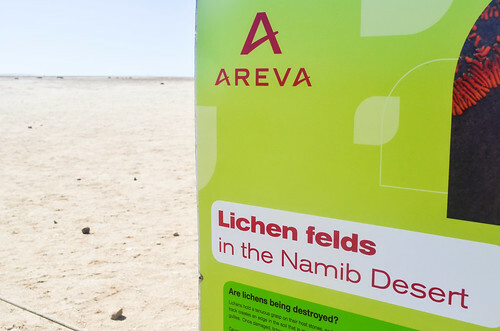 But this sign is here announcing the brand new Areva desalination plant right by the road. 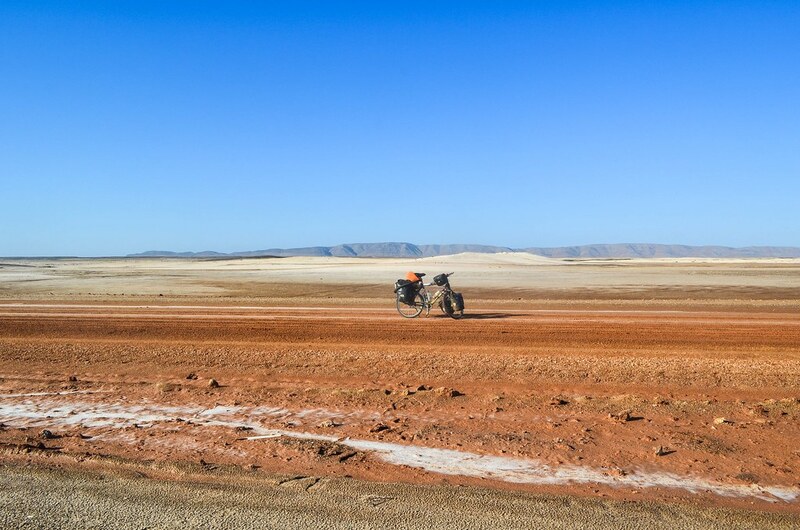 It was inaugurated in 2010 and was supposed to supply water to the Trekkopje uranium mine, 40 km inland. The satellite view clearly shows the pipeline linking the desalination plant on the coast to the mine near the B2 road. But with uranium prices dropping since Fukushima, Areva did not start up the mine and the water can supply three other operating uranium mines in the region instead. On the other side of the road, the Wlotzkasbaken is a fishing-holiday settlement, each house with its own water tower, generator, and colorful wooden boat in the garden. 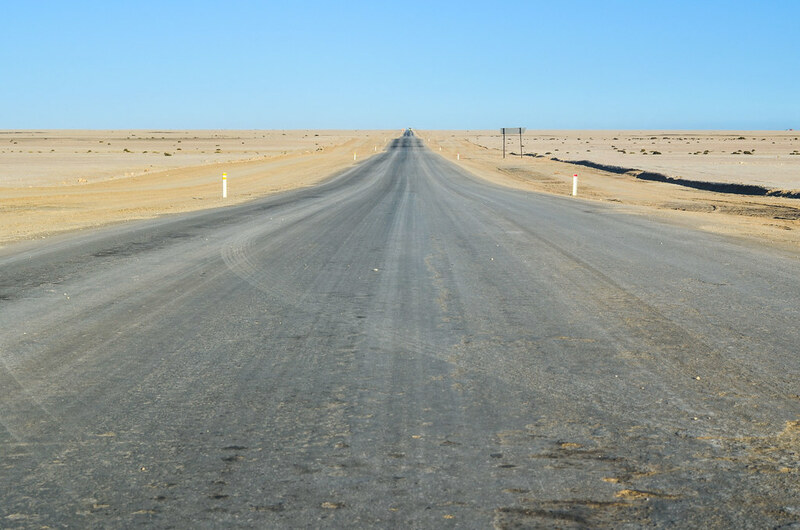 And 40 km before Swakopmund is when the wind decides to pick up. It gets stronger and stronger as I cycle closer to the city, and here again, it’s right against me. 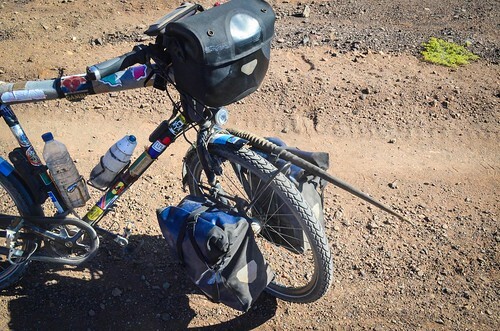 I can’t cycle at all; I even feel that walking is as fast as cycling, and try it. It’s making me so angry, but I can’t do anything. This headwind is terrible. 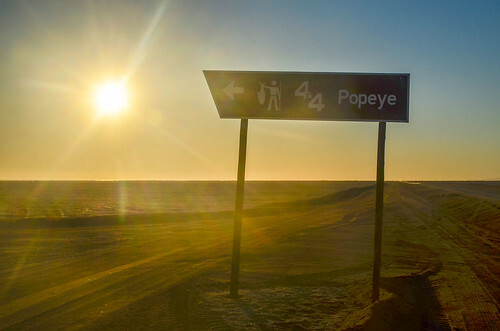 I’ve not been to Swakopmund yet, but I already hate this place. I am so close to the end, but the closer I get, the slower the wind makes me. I had enough time to reach the city before 5, but now it seems I won’t be there before 6 pm. I have to make breaks behind road signs so that I don’t turn crazy. The constant wind in the ears is too noisy. My back is sore and I’m fed up, but I must get there. I finally see the entrance of the city once on the 4 km long last straight stretch. I am close to having cramps as cycling in these conditions is like cycling a steep slope in my lowest gears. My speed is down to 5 km/h now. 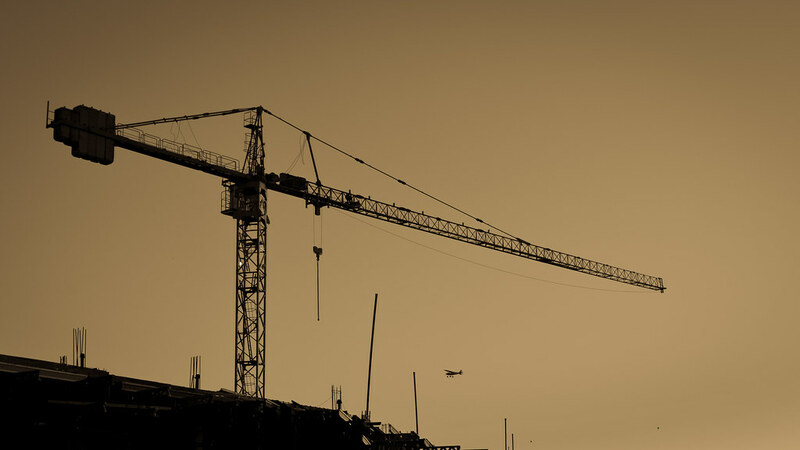 I try to go through the first neighborhood, a whole complex of “retirement estates”, hoping that the buildings will break the wind. 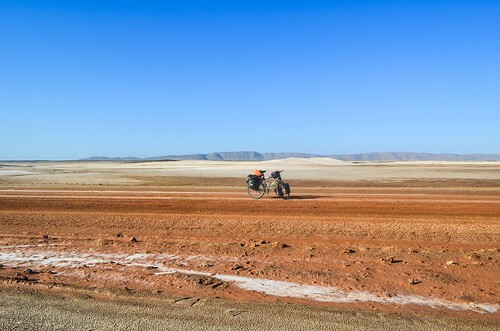 But even inside the town the wind is strong, and worse, as I get lots of dust in my eyes. 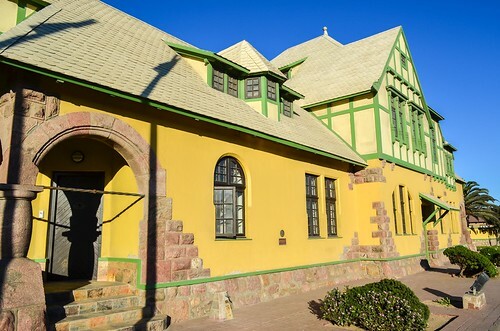 The museum of Swakopmund takes interested visitors the first Friday of every month to the Rössing uranium mine in Arandis. My legs are dead and can barely walk up a staircase, but at least I made it on time. 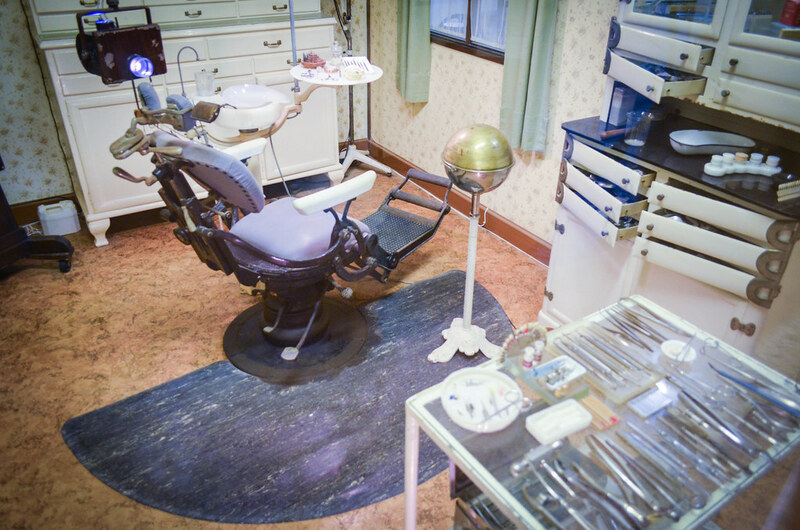 The photos of the mine will come in the next post. 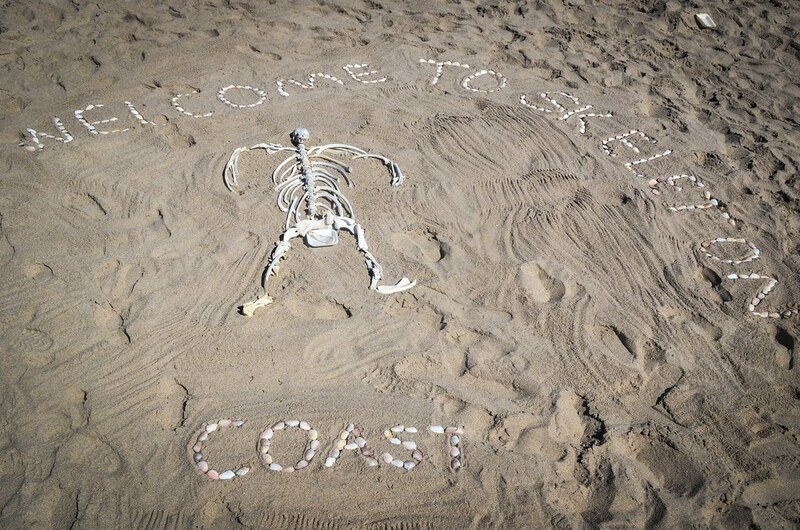 I’ll finish this Skeleton Coast post with a tour of the town of Swakopmund, an oasis in the desert as comfortable as the salt road was deserted, where I am resting for three days. 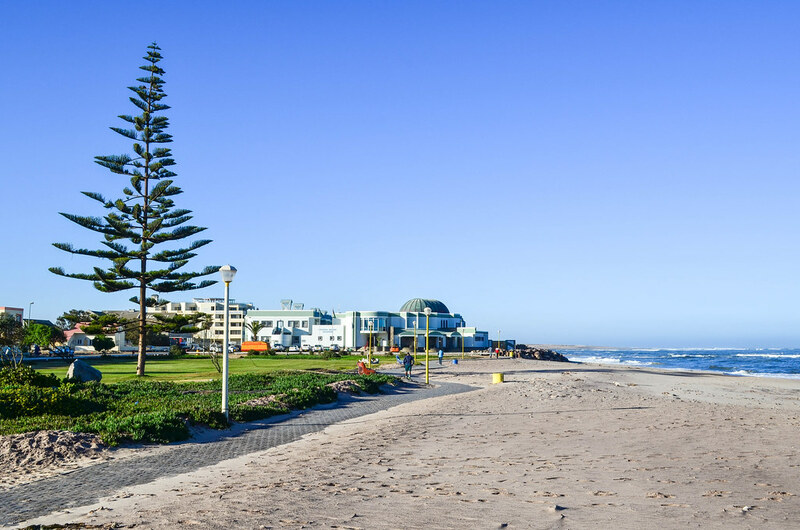 Swakopmund was founded in the late 1800s by the Germans as a harbor town, since the best spot on the Namibian coast was already occupied and claimed by the British (Walvis Bay, a mere 30 km south). To me, it means buying food at the several supermarkets and finding a new pair of shoes. 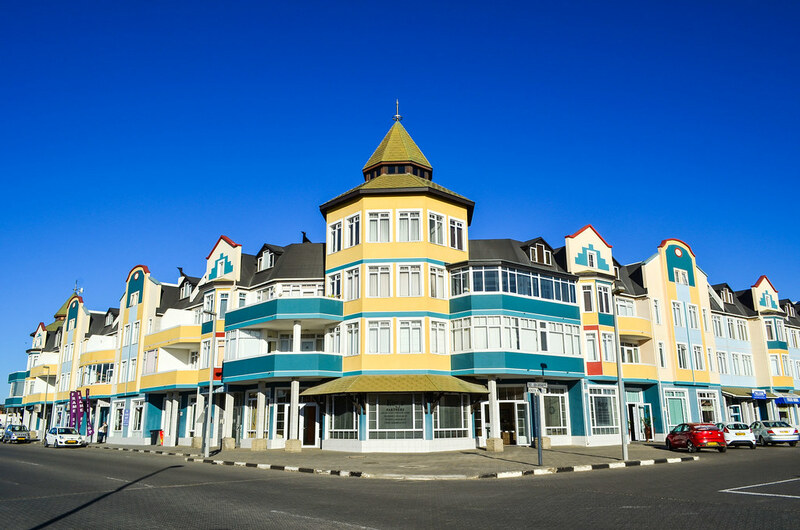 For for everyone else, Swakopmund is a German disneyland-like resort where the people from Windhoek, the South Africans and the rest of the world flock during the high season. It’s funny to see Germany here. 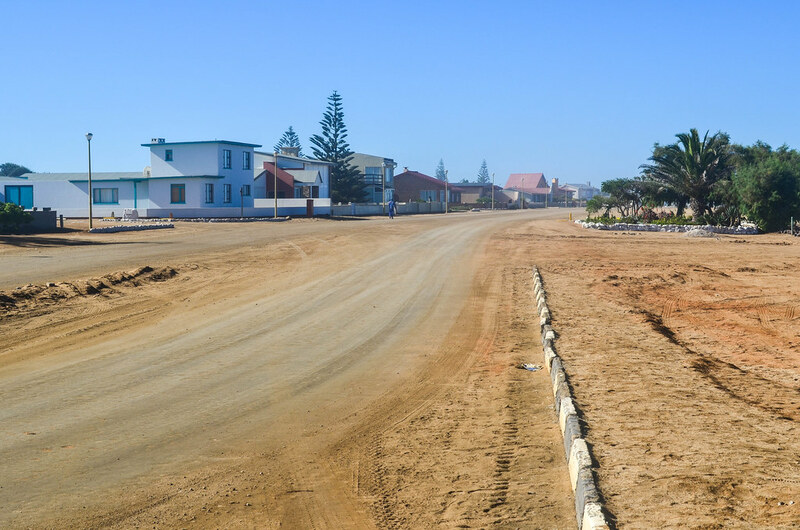 The streets are very clean, and it’s safe to walk outside at night. Indeed, it’s maybe the worst place to visit for someone who wants to experience Africa. The townships are far away from the city center, which is as “White” as Africa can get. 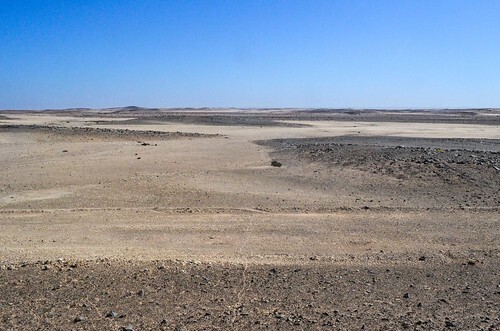 On the other hand, it’s quite an achievement to build a green city in a desert like this one, where the water is scarce and the winds are strong. I guess the electricity comes from Windhoek. It reminds me of Dakhla in Western Sahara, even if there the city center had more of a desert feel than Swakopmund. 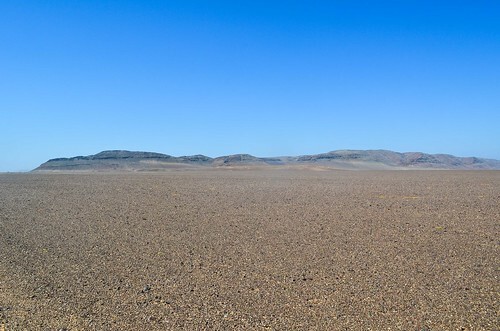 Here, I wouldn’t believe that the desert if 5 km away if I were dropped in the city center. There are Germans in Namibia who speak German at shops and send their kids to German schools, but I’ve not seen it much. I am at times talked to in Afrikaans. At the only bike shop of the town, I find a spare non-Chinese tube for my bike, which also needs a good cleaning, and new cheap shoes, which I fear, won’t last long. 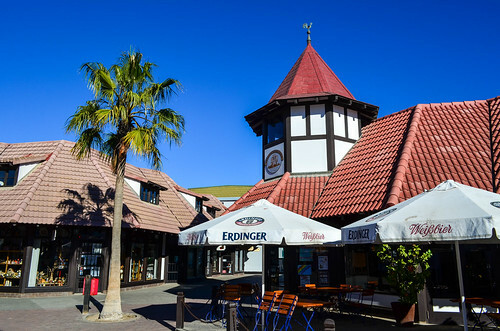 And, disappointing for a German heritage, the only beers available are the Namibian lagers, and sometimes the Erdinger Weissbier. At 5 pm, the town hibernates. The shops close, the Blacks return to their township, and only tourists are still seen on the streets. 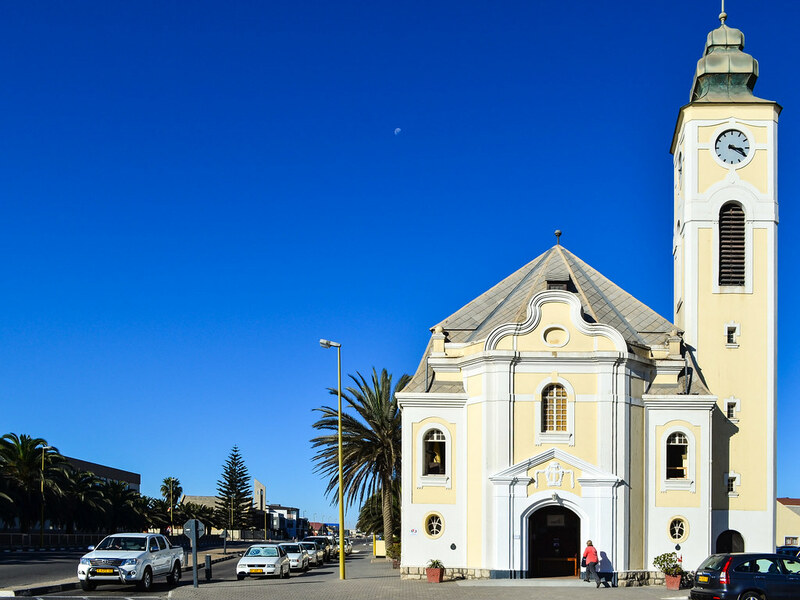 Well, Namibia is not particularly famous for its nightlife, and the 4th city of the country appears to me like a museum-town. Your blogs are great JB. I really love your “eating cookies at the speed of a chocolate-covered neutrino” and “I’m riding a unicorn with a dinosaur friend!” descriptions! !